Sales - Crain Walnut Shelling, Inc. Through innovation and sustainability, Crain Walnut Shelling, Inc. is able to produce a wide selection of products. Our highly efficient shelling and foreign removal technology, in-house quality control and certified vacuum fumigation chambers enable us to build a better ingredient at an extraordinary value. From the tree to the table, the Crain organization’s mission is to meet or exceed all product specifications, provide truly effective and efficient customer service, while maintaining competitive market pricing. With both bulk and retail packaging available, the Crain of California “Red Box” is recognized worldwide as a sales leader for the Chandler variety and other premium product styles. Crain Walnut Shelling, Inc. ships nationwide and to all major international markets including Europe, Asia, South America, the Mediterranean and Australia. Our specially trained logistics staff is readily available to consult on all your shipping and freight forwarding needs. Looking for a specific color, size, or specification? 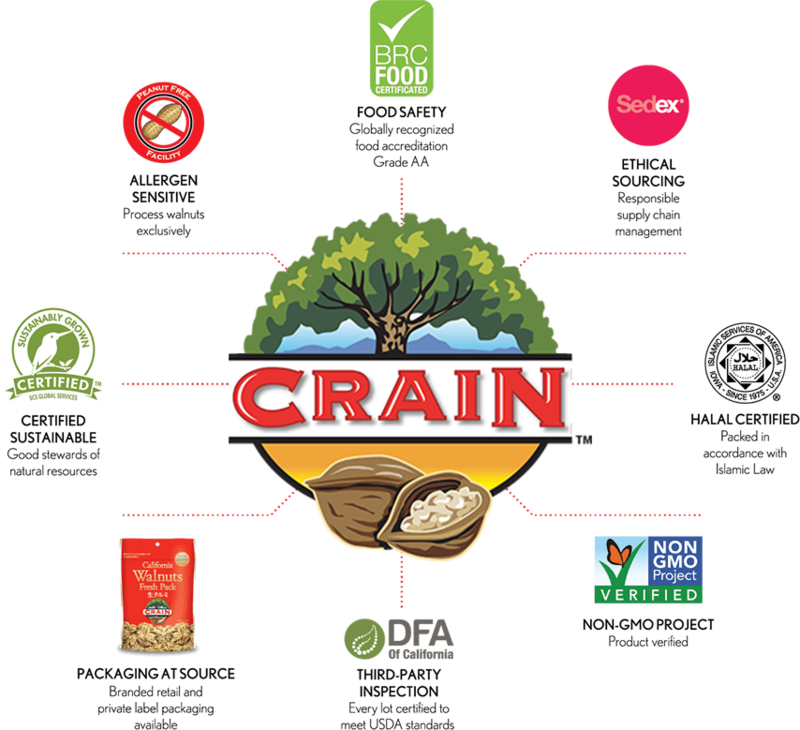 Crain Walnut Shelling, Inc.’s state-of-the-art equipment and certified vacuum fumigation and pasteurization chambers enable us to achieve even the most stringent food specifications, including a FDA approved treatment that is certified to achieve a 5-log reduction for Salmonella. For more information or sales related questions, please contact sales@crainwalnut.com.